Brian Millar, strategy director at Sense Worldwide and co.Design contributor, spent a couple of years as a stay-at-home dad and learned a few things that proved valuable to his career as a creative strategist. His insights are remarkably dead on. What that says about consumers, I’m not sure; but the 5 lessons he mentions can certainly go a long way in teaching consumer behavior. 1. Emotional benefits sell better than rational ones. Emotional: “Kids, tonight we’re having…pasta presents!” – also known as spinach ravioli. 2. Don’t ask your consumers whether they want something new. He cites two really smart guys in talking about how he got his kids to watch Laurel & Hardy in black and white, an impressive feat when they were used to watching the Tellytubbies. Consumers don’t always know they want something until its put in front of them. Did you know you wanted an iPhone before those first commercials came out? It’s more likely that on June 4, 2007, you had no idea such a phone was even possible. 3. Bonuses are better than bribes. Sales promotions fall into 2 categories: bribes and bonuses. Bribes: think vouchers, money-off deals, etc. When the bribes dry up, everybody moves on. Millar uses the example of airline-loyalty schemes: when you pay for people to like you, you shouldn’t be surprised when they demand more. Bonuses: getting something extra for doing something you’d like to do anyway. Think 2-for-1, discounted upgrades, etc. Bonuses increase loyalty after the promotion ends, where bribes do not. 4. Move beyond functional equivalence. For toddlers, everything is a toy. 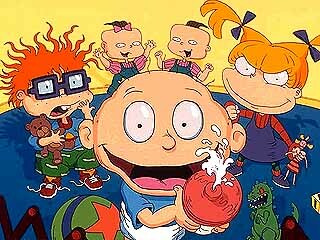 The toy itself, the box it came in, pots and pans, or a pile of rocks – it hardly matters. As a toy maker, the goal is to make something that’s especially fun. 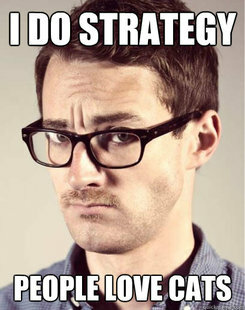 That’s what marketing really boils down to. All cars are basically functional nowadays, and a Rolex tells time as well as the $20 watch from Target. Price has to be justified with better design, luxury, and superior service. 5. Nothing kills a bad product faster than good advertising. It doesn’t matter how good your ad is, if the product is crap the product is crap. Telling his kids The Louvre would be better than Star Wars may have gotten them through the door, but skepticism quickly reared its head. I haven’t posted in a while because I just got back to school; well actually, last Monday, but things have been crazy hectic and my final welcome week certainly did its job. Anyways, I’m back and hope to make blogging part of my schedule during the year. We’ll see how that goes. First – I think it officially means I’m a grown-up when I’m purchasing books that fall under the “textbook” category on the Barnes & Noble website for pleasure. Well, I guess we’ll call it that. 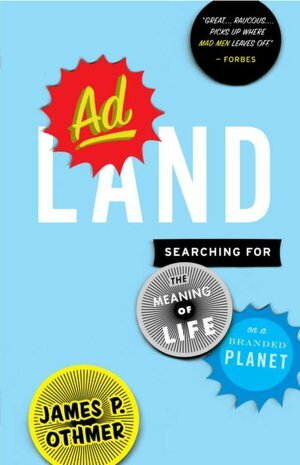 My first “professional development” book purchase was Adland: Searching for the Meaning of Life on a Branded Planet by James P. Othmer. It’s actually been a very entertaining read so far – so if you’re also into advertising I’d definitely give it a read! 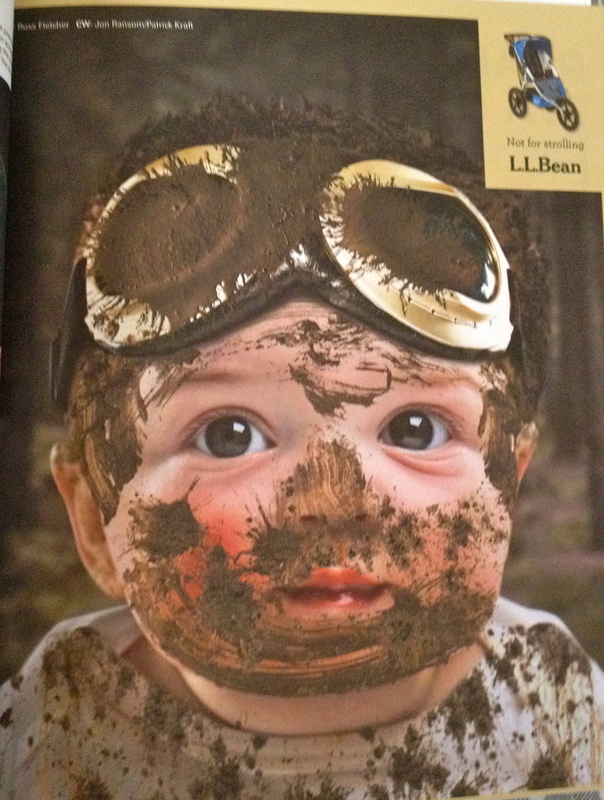 Second – I got the best mailer, IMO in the history of mailers, from VCU’s Brandcenter a few weeks ago. People look at me cross-eyed when I tell them I want to go to VCU for grad school; but if you know anything about advertising, you’ve likely heard of the Brandcenter (formerly AdCenter) in Richmond. After talking to an account planning professional, I knew that VCU and Miami Ad School were the programs I should be looking into, and this only cemented why. I’m a sucker for packaging, design, creative messaging, and really anything memorable. 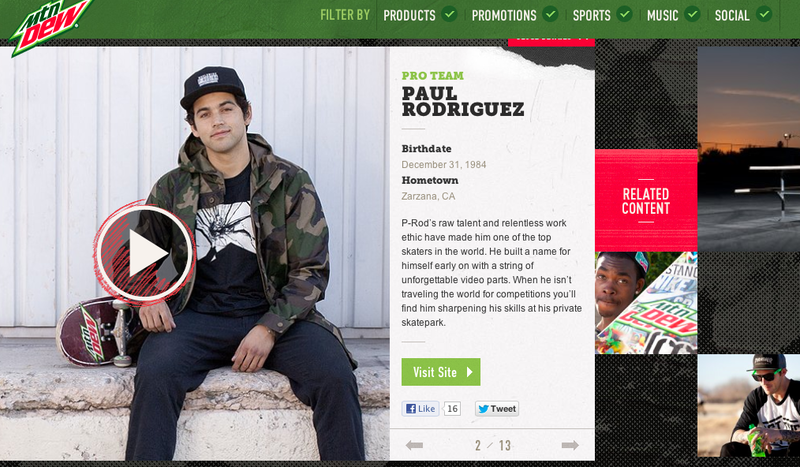 Brandcenter’s Sixty definitely fits that description. Even if you aren’t thinking about VCU as a destination, it’s worth a look to really see where the future of advertising is getting its start. Essentially, it showcases student work and emphasizes just how closely the disciplines work together – art direction, copywriting, creative technology, creative brand management, and the program I’ll be applying to, communication strategy. There’s some seriously awesome creative work in the magazine – a great deal of which I wouldn’t have been able to tell you was produced by students, and a pretty hilarious spread featuring the “Junior Art Director” meme. You can request a copy of Sixty here. The magazine definitely proved to me why agencies love to hire out of the Brandcenter, and motivated me even further to learn about the work that’s being done at VCU and Miami Ad School. 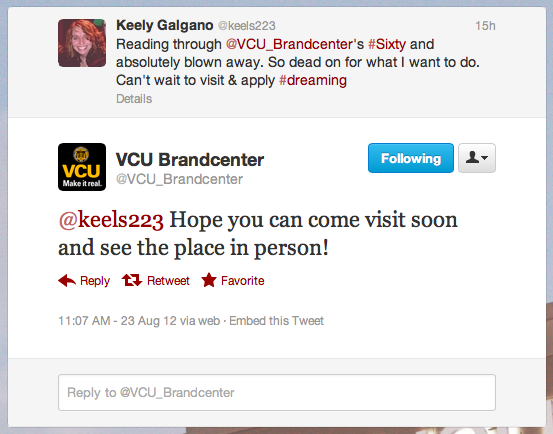 I also think it’s pretty awesome that someone at VCU replied to me on Twitter, and I can’t wait to visit over fall break! Finally – This article in Adweek is the story of my life, and my last piece of “if you love advertising, do x” advice for the day. To finally find something that you’re truly passionate about is the best feeling in the world – and to know that you’re working along side others who feel the same way is even better. So much of my time is about to be spent with graduate school applications and job hunting – which are tedious activities to be sure – but I’m so excited to embark upon a journey where I’ll (fingers crossed) join fellow “Ad Nerds” in shaping brands of the future. 2. The Spice Girls ARE reuniting at the closing ceremonies! 3. In honor of the fastest man in the world, Usain Bolt’s “This is Sportscenter” spot. 4. 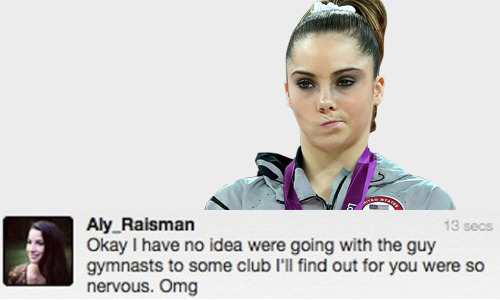 McKayla is not impressed with Aly Raisman’s coverup. 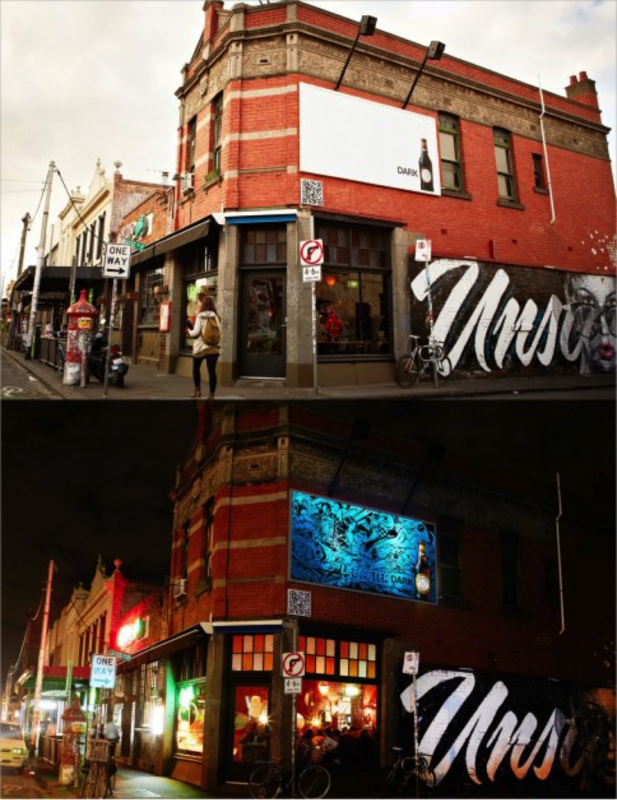 Australian brewer Coopers, with ad agency kwp!, created a “Life After Dark” billboard – with the help of world-renowned Chicago-based street artist and illustrator Pose. The billboard, only visible at night, was done with luminous UV paint, so it appears blank during the day. Check out a few videos documenting the creation of Life After Dark here, here, and here. Love him or hate him, Bill Clinton made a hell of a lot of sense speaking at the Cannes ad festival on June 21. His message was simple: Use your power to communicate to help solve some of the world’s biggest problems. In looking at graduate advertising programs, and speaking to professors and students alike, Southern Methodist University’s Temerlin Advertising Institute stands out in this regard. Program director, Dr. Carrie LaFerle, made clear to me that one of the cornerstones of TAI’s program is social responsibility. She truly believes that “the new generation of advertising professionals believe it’s okay to succeed, but not at any cost.” The program instills in its students respect for the consumers they will serve and accountability for the culture they will help shape. Clinton emphasized society’s need for honest, synthesized communication and Adland’s power to create just that. In a landscape that is increasingly global, enabled by technology, and overwhelmed with choices, communicators’ influence is greater than ever before. Focused messages, good or bad, reach consumers faster and permeate deeper. Advertisers have a responsibility to acknowledge the new socially and globally conscious consumer, and to use their unique tools as a force for social change. Advertisers shift toward social media has served consumers and brands well – a similar shift toward social consciousness will undoubtedly do the same. The more I think about it, the more I realize this is actually important to me – there’s too much negativity, too much lying, and too many messages that poison consumers’ thoughts, and too often in the case of women and adolescents, confidence. To be able to make a positive impact by doing something I love? What could be better?